LAS VEGAS, NV--(Marketwire - Oct 26, 2012) - Hemp, Inc. (PINKSHEETS: HEMP) -- With 12 days to the Presidential Elections and marijuana and hemp being voted on in states all across America, mass media exposure could not have come at a better time. According to the article in Newsweek magazine, "If current polls hold, voters in Washington State and Colorado will vote to legalize marijuana..." Red Dice Holdings President and Managing Director of Dixie Elixirs, Tripp Keber, presented their state-of-the-art Dixie manufacturing facility in Denver, Colorado: a state where regulated for-profit cannabis is flourishing amongst hundreds of thousands of consumers who have been given prescriptions by their M.D.s for the potent green plant. 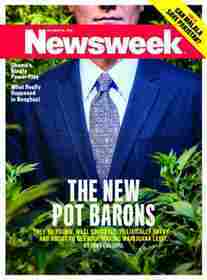 Newsweek reminded its readers of the 40-year fight launched by boomers, one of which includes Bruce Perlowin (CEO of Hemp, Inc. (PINKSHEETS: HEMP)) who has been the driving force behind the industry, at a time when there were no public corporate structures. Bruce Perlowin, who, with the help of his friends, singlehandedly created and continues to boost the public company sector in the hemp and marijuana industries. A sector which consists of, and what Perlowin now dubs, The Tremendous Trio of industrial hemp and medical marijuana stocks. 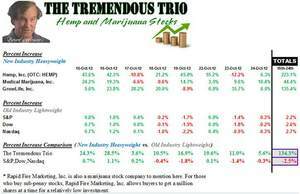 The chart below illustrates the top three marijuana companies in the industry (Hemp, Inc.; GrowLife, Inc.; and, Medical Marijuana, Inc.) and their astounding growth through this week... a growth curve Perlowin predicted. Potential investors now know where to invest. The watchful eye of investors seems to have latched on to The Tremendous Trio of Industrial Hemp and Medical Marijuana Chart. "Just compare The Tremendous Trio's performance with a collective average growth of 134.3% to the old paradigm trio of S&P, Nasdaq and Dow with a collective growth curve of -2.5%. This chart clearly indicates where people from all over the world should be investing their money," says Perlowin. Red Dice Holdings is the portfolio company of one of The Tremendous Trio (Medical Marijuana, Inc.). The original founder of Medical Marijuana, Inc. was Bruce Perlowin, an innovative, savvy, aggressive entrepreneur and progressive advocate of the medical marijuana and hemp industries. He was, subsequently, the first leader promulgating a viable medical marijuana public company which has paved the way for other marijuana stock companies to follow. According to Perlowin's son, Aubree Arias, CEO of Compassion Capitol, LLC, his father has, "made great strides in unifying and educating the public about the hemp industry. Before my father took Medical Marijuana, Inc. public, there were no publicly traded corporations in this arena. He had the courage to be a pioneer and risk bringing Medical Marijuana, Inc. into the public equities market. Taking on the stigma associated with hemp has not been an easy road, but he has paved the way, and we are seeing the fruits of that with over a dozen publicly traded entities in this sector. Now we are poised to have Hemp, Inc. (www.hemp.com) become the 'Amazon' of the hemp world, as we expect rapid growth in the industry." Perlowin's own Hemp, Inc. (PINKSHEETS: HEMP) is also one of the Tremendous Trio and is the largest publicly-traded company of hemp stocks in the US by market capitalization with hemp-based products proven to increase the body's overall health and performance. The company boasts HerbaGenix™ nutraceuticals (www.herbagenix.com); BasicHemp (www.basichemp.com), their hemp protein shakes brand; and, custom-branded MJ Lover for Him and MJ Lover for Her (www.mjlover.com) and Re-Load Hemp nutraceuticals (www.re-load.biz) which is derived from a blend of organic nutrients, herbs, and vitamins including hemp extract (0.00% THC) and AFA blue-green algae which is known for its healthful effects. So while educating and providing consumers on the many uses of industrial hemp, Hemp, Inc. (PINKSHEETS: HEMP) is forging a path in the industrial hemp industry. What did the world renowned and respected economist Paul Zane Pilzer predict? That the next trillion dollar industry will be the wellness industry. Industry watchers foresee hemp products being in every health food store including CVS, Costco (which is already selling Nature's Earthly Choice Hemp Seed), Target, Walmart, Whole Foods and every convenience store, smoke shop, head shop, dispensary, and more. Now, especially in Colorado, self-described "social entrepreneurs" are emerging. The dawn of a Green Rush whereby businessmen and pot barons alike are expected to cash in on an industry that has finally crossed over to the mainstream. The industry seems to be unstoppable. When asked, what is your pick of the week from The Tremendous Trio, Bruce Perlowin of Hemp, Inc. (PINKSHEETS: HEMP) replied, "To be perfectly candid, I would have to go with GrowLife, Inc. When I look at the divisions of their company PhotoTron, Stealth Lighting, Greners.com, GrowLife Productions and Cannabis.org, and today announced the acquisition of Urban Garden Supplies. I see a constellation of companies and/or divisions that have incredible potential in our marketplace. And they've grown 135.4% in the last 8 trading days. Besides, I've been buying heavily myself in that company's stock. I think in terms of doubling your money and I believe PHOT has much greater potential of doubling faster than any of us right now." HEMP, Inc. (PINKSHEETS: HEMP) focuses on the vast market created by the quickly emerging, and growing, multibillion dollar industrial hemp industry. HEMP, Inc. is not involved in the cultivation or marketing of medical marijuana. It is the company's belief that legalization of hemp in all 50 states and at the federal level will come to pass. With that in mind, the company is building infrastructure with the potential to gain substantial market share before and after industrial hemp prohibition ends. (Pending any federal licensing or other requirements, that may be enacted after hemp prohibition ends). Hemp, Inc. (PINKSHEETS: HEMP) seeks to benefit many constituencies, not exploit or endanger any group of them. Thus, the publicly-traded company believes in "upstreaming" of a portion of profit from the marketing of their finished hemp goods back to its originator, in which most cases will be the American farmer, cultivating natural, sustainable products. By Hemp, Inc. focusing on comprehensive investment results -- that is, with respect to performance along the interrelated dimensions of planet, people and profits -- our triple bottom line approach can be an important tool to support sustainability goals. CEO of Hemp, Inc., Bruce Perlowin, is positioning the company as a leader in the industrial hemp industry, with a social and environmental mission at its core. In fact, he wanted to, consciously, found a business with non-financial goals that weren't an after-thought, but were part of its DNA. For example, a percentage of proceeds of the hemp.com products are donated to PatchAdams; Kin's Domain (www.kinsdomain.us) which uses natural, organic, sustainably harvested, renewable, pure raw materials; and, an overall use of renewable energy sources. This press release may contain certain forward-looking statements and information, as defined within the meaning of Section 27A of the Securities Act of 1933 and Section 21E of the Securities Exchange Act of 1934, and is subject to the Safe Harbor created by those sections. This material contains statements about expected future events and/or financial results that are forward-looking in nature and subject to risks and uncertainties. Such forward-looking statements by definition involve risks, uncertainties and other factors, which may cause the actual results, performance or achievements of Hemp, Inc. to be materially different from the statements made herein. About this company Hemp, Inc.
**Information sourced from daily stock market closings.